Britain's Queen Elizabeth II pleaded for world peace in her first visit in five decades to the UN headquarters during a whirlwind tour of a sweltering New York. After addressing the world body she went to Ground Zero, where she laid a wreath in tribute to the nearly 3,000 people killed when Islamist hijackers slammed two airliners into the Twin Towers of the World Trade Center on September 11, 2001. At the UN General Assembly, Elizabeth II noted she'd last visited there 53 years earlier, when the United Nations was in its infancy. Praising the "remarkable" achievements of the UN since then, she said that "the waging of peace is the hardest form of leadership of all." 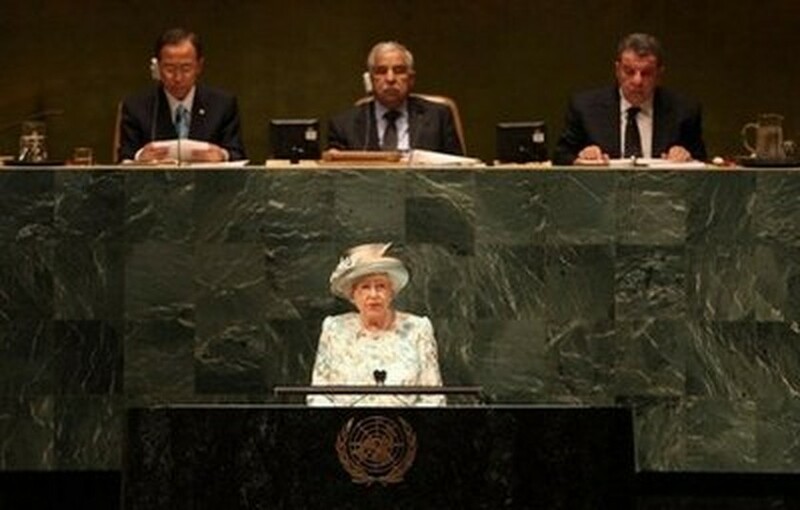 Queen Elizabeth II addresses the United Nations General Assembly July 6, 2010 in New York City. New challenges of "terrorism" and "climate change" were adding to the huge tests facing the world body, she said. "When people in 53 years from now look back on us, they will doubtless view many of our practices as old-fashioned. But it is my hope that, when judged by future generations, our willingness to take a lead... will stand the test of time." The 84-year-old monarch, who was last in the Big Apple in 1976 and at the UN in 1957, wore a two piece white ensemble with blue and beige print and a matching silk hat as she arrived with husband Prince Philip for the one-day visit, which followed a nine-day stay in Canada. She was at the UN as queen of 16 states and head of the British Commonwealth. From there she went to Ground Zero where she was met by an honor guard and local officials including Mayor Michael Bloomberg. Following the ceremony she met with relatives of victims. Paula Berry, who lost her husband on 9/11, told NY1 television the queen "was conveying a message to us." Berry said she'd repeatedly told her young children that 9/11 had been "a world event and this really reinforces that message." After opening Manhattan's British Memorial Garden, dedicated to the 67 British victims of 9/11, Elizabeth II was flying home. New York is accustomed to celebrities and heads of state, but the queen's visit provided welcome distraction from a record heatwave. The National Weather Service measured 103 degrees Fahrenheit (39.45 Celsius) in Central Park in mid-Manhattan, easily breaking the 101 degrees record set for July 6 back in 1999. Heat warnings were posted throughout the region. The Daily News tabloid published tips on etiquette, instructing readers not to bow if they meet the queen, since they are not subjects, but neither to try offering her a New York-style "fistbump or high-five." Readers were also advised to steer clear in conversation from mentions of Sarah Ferguson, the former wife of Prince Andrew who was caught attempting to sell access to her ex-husband in a media sting in May, then admitting that she was suffering from money and drink problems. "Chat instead about dogs and horses; the queen likes them," the News suggested. Commuter freesheet AM New York, meanwhile, warned the monarch might not like New York's fierce temperatures. "God Save the Queen (and us!)" the front page joked. "Her Majesty visits Baked Apple." The royal couple's Canada trip took them to a horse race, a visit to the factory making BlackBerry smart phones and Canada Day celebrations. There was drama on Monday when a power outage plunged Toronto into chaos just ahead of a state dinner. Thousands of people were stranded in office buildings or stuck on roads snarled by the sudden absence of traffic lights. The British head of state's tour comes at a time when Buckingham Palace is feeling some of the same budget crunch pressuring the rest of the country. Britain's finance minister George Osborne announced a shake-up in royal funding in June. He also said that the 7.9 million pounds (9.5 million euros, 11.6 million dollars) royal operating budget will remain frozen, as it has been for the last 20 years, despite media reports that royal officials are requesting an increase.